Blocking the production of new immune cells in the brain could reduce memory problems seen in Alzheimer's disease, a study suggests. University of Southampton researchers said their findings added weight to evidence that inflammation in the brain is what drives the disease. 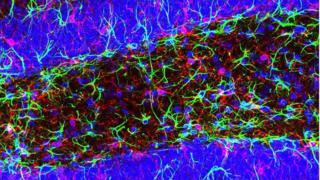 A drug used to block the production of these microglia cells in the brains of mice had a positive effect. Experts said the results were exciting and could lead to new treatments. Up until now, most drugs used to treat dementia have targeted amyloid plaques in the brain which are a characteristic of people with the Alzheimer's disease. But this latest study, published in the journal Brain and funded by the Medical Research Council and Alzheimer's Research UK, suggests that in fact targeting inflammation in the brain, caused by a build-up of immune cells called microglia, could halt progression of the disease. Researchers found increased numbers of microglia in the post-mortem brains of people with Alzheimer's disease. Previous studies have also suggested that these cells could play an important role. Dr Diego Gomez-Nicola, lead study author from the university, said: "These findings are as close to evidence as we can get to show that this particular pathway is active in the development of Alzheimer's disease. "The next step is to work closely with our partners in industry to find a safe and suitable drug that can be tested to see if it works in humans." In the study, mice which were given a drug to block a receptor - called CSF1R - responsible for the rise in microglia in their brains, had fewer memory and behavioural problems. The drug also prevented the loss of communication points between nerve cells in the brain which usually happens in people with Alzheimer's. Dr Mark Dallas, lecturer in cellular and molecular neuroscience at the University of Reading, said this was "an exciting discovery" which could explain "why drugs designed to treat Alzheimer's have so far been unsuccessful". He added: "While this basic science research provides strong evidence, the challenge will now be to develop medicines for people with dementia, so we await the development of clinical treatments with interest. Too often, this has been the stumbling block in turning observations in the laboratory into a workable therapy." Dr Doug Brown, director of research at Alzheimer's Society, said the study findings were "encouraging". "With an ageing population and no new dementia drugs in over a decade, the need to find treatments that can slow or stop disease progression is greater than ever." The drug to slow Alzheimer's?